Hi friends! 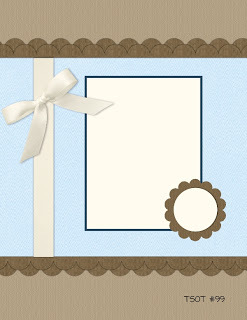 It's a new year and that means that new products from Stampin' Up! are just around the corner. But before we move on to the new products, you can still make purchases from the Holiday catalog if you haven't purchased everything you had your eye on! You can make these purchases in my online store. Also today is the last day to purchase any single stamps that were introduced last year. Tomorrow is the beginning of the Spring catalog. As I said on yesterday, if you did not receive a copy and would like one let me know and I will be happy to get one in your hands. Today I decided to work on a Thank You card, a co-worker of my husband gifted me with her unused stamps and I really need to thank her for being so thoughtful. I'm also planning to make her an assortment of cards. I think she will like that! So I used a hodgepodge of products to make this card; items from the Holiday, Spring and Sale-a-bration catalogs were used. When I first saw the Spring catalog I fell in love with the Secret Garden set. If you know me you know that I like anything floral. So I had to have this set and this is the set that I worked with today. I used a sketch from the Try Stamping on Tuesday Blog to help get me started. Thanks for stopping by today! Click here to place a Stampin' Up! order. You can never have too many stamps. The problem is knowing which one to play with first. Great job on the sketch Vanessa and thanks for sharing your talent with us at Try Stampin on Tuesday. at Try Stampin' on Tuesday. Hi Vanessa! I am stopping by from the Ultimate Blog Challenge. 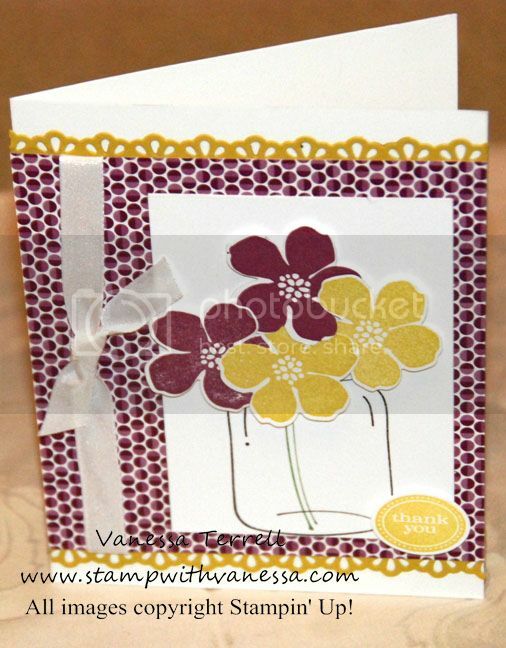 I love the colors you used in this card Vanessa and the layout is beautiful. I just started making handmade cards myself and I love seeing everyone's work! So inspirational =) Thanks for sharing! Vanessa you did a great job on the sketch and I really love the color combo. Great card. Thanks for playing along at Try Stampin' on Tuesday. Love the set you've used - this may now make it to my wishlist! (not sure if that is a good or bad thing). Thanks for playing along with us at Try Stampin on Tuesday.